Few films about the recession were as unflinchingly grim as JC Chandor’s debut feature Margin Call. Time and time again, well-meaning, sympathetic characters (and others less so) were given no choice but to act deplorably leading up to the greatest economic disaster since the Great Depression. “It’s all just the same thing over and over; we can’t help ourselves. And you and I can’t control it, or stop it, or even slow it. Or even ever-so-slightly alter it. We just react,” one Wall Street executive stated almost too succinctly. Despite a number of flaws common to first time writers and directors, the film tapped into a growing pessimism toward the systems that make the world run. Martyrs could choose to throw themselves aside in moral indignity, but it made no difference. It was the system — America if you want to put it broadly — that was rotten to the core. With his third feature, Chandor revisits the theme of American degradation. “America, 1981” the opening title announces. This was, apparently, an exceptionally violent year in America’s history. 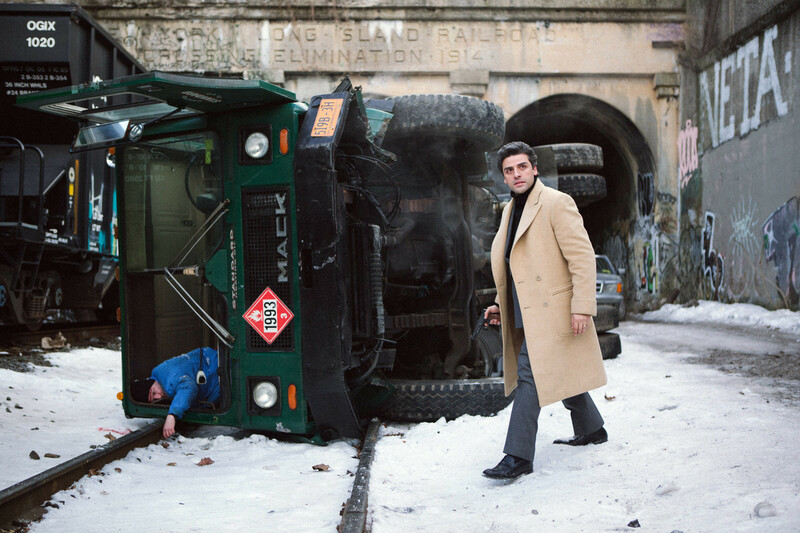 Abel Morales (Oscar Isaac, whose costumer likely received the note “Michael Corleone, but… nah just go with that”) is about to ink a deal that would give his company, Standard Heating Oil, a prime chunk of real estate by the river. This would allow them to ship their own product and wield more influence over the market. Abel inherited the company from the father of his wife, Anna (a glowing but underutilized Jessica Chastain), and despite presenting himself as an honest, humane person, he also has years of institutional mistrust and illegal practices from his predecessor working against him. Abel provides a stark alternative to the impotent lackeys of Margin Call. He refuses to illegally arm his drivers, even when competitors start hijacking his fuel trucks. He meets regularly with the district attorney charged with cleaning up his industry (David Oyelowo). He insists on using legal means to obtain the $1.5 million needed to secure the plot, even when that seems almost impossible. As he tells his rookie salespeople, “You must present yourself like you are better because you are better. You will never do something as hard as staring someone in the eye and telling the truth.” He’s very fond of this brand of idealistic wisdom. “When it feels scary to jump, that is exactly when you jump. Otherwise you end up staying in the same place your whole life, and that I can’t do,” he later preaches. 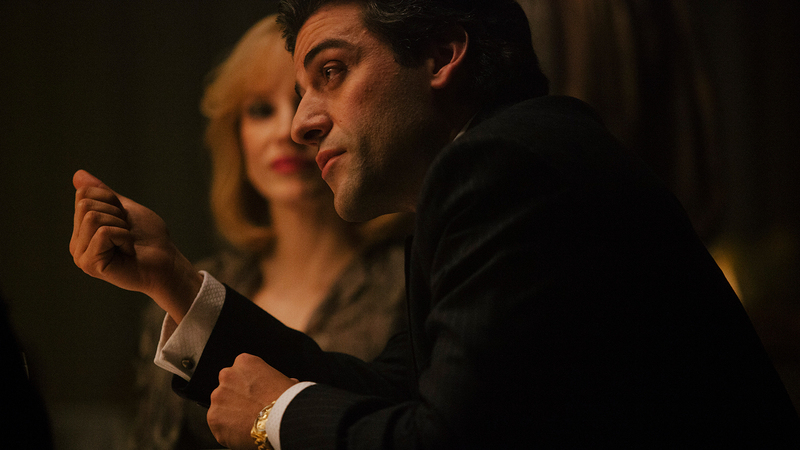 In theory this is precisely the right move for Chandor to make. Antiheroes like Walter White, Don Draper, and Tony Soprano have captured the public imagination, living the life of the outlaw as both cautionary tale and wish fulfillment fantasy. Presumably the alternate should also be true. Warnings against the path to hell are only worth something if there is also a path to heaven. Like Amy Jellicoe on HBO’s short-lived Enlightened, A Most Violent Year contrasts stories of rebels pushing against polite society with the story of a rebel whose virtue is in stark contrast with the chaotic world in which they live. Unfortunately, the film cannot live up to its ambitions. The trouble with Abel is not merely the jealous Cains trying to beat him down and steal his offering to God. It’s also that he’s terribly dull (no offense to Isaac, who does the best he can with the material). Aside from platitudes about the “American Dream,” Abel is very fond of saying exactly what he is thinking. The land deal has nearly exhausted all his resources. How do we know this? He turns to someone by the camera and says, “We don’t have any money left.” Later, in case that didn’t take, he emphasizes, “We need to close this deal. We can’t wait any longer. This is very bad for me!” This kind of static, matter-of-fact dialog pollutes the whole film. This is the type of film where the hero has three daughters who appear on screen only when their innocence or safety is threatened. The characters all represent big, heady notions about business and ethics, but they fail to breathe outside their allegorical function. What do these people do for fun besides sit around, drink, and talk about the plot? What flaws do they have besides the one or two traits that decide their role in the story? The whole thing honestly feels like a first draft, before the lines get punched up and the cursory details are tacked on. Films can and should be socially responsible, and there have been great films about “America” as an overarching idea. Martin Scorsese’s The Wolf of Wall Street and Kelly Reichardt’s more allegorical Meek’s Cutoff come to mind. But these stories also manage to be about flesh and blood humans the audience can relate to. We can see the way these larger ideas relate back to us. She’s referring to the way a lowly immigrant won the heart of mob boss’s daughter, gained the respect of his corrupt industry, and put himself in a position to make real, affecting change. This is precisely the link I was looking for. How does this decided other, this larger-than-life person making larger-than-life decisions, emerge from the amoebic base of a vulnerable, workaday schmuck? Fine, he’s a metaphor for America. He’s looking at a history of cheating, violence, and corruption he cannot change, but he has to find the best way to move forward. But that’s not what she’s asking. She wants to know how the protagonist, the flesh and blood cipher for the audience, fits within this myth. Abel provides her no answer. Chandor seems to think it’s sufficient we see long sequences of him running through the city so we know he’s a really hard worker.